What do I need to book a band for my wedding? Why Use Live Entertainment For Your Wedding? Your wedding is the biggest event of your life. From rehearsal to reception, you carefully plan every detail; ensuring the memories of your love celebration last a lifetime. Enhancing your special moment with the best wedding music and entertainment isn't just a detail, it's a necessity. Most wedding bands and musicians will make every effort to accommodate your needs and requests on your wedding day. 1. Announce the members of your wedding party as they enter the reception and make general announcements. 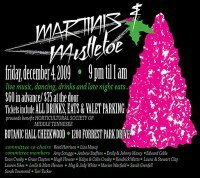 Martinis and Mistletoe at Cheekwood's Botannic Hall kicked off the holiday season in smashing style. The social set gathered Friday, December 4th to eat, drink martinis and be merry. Guests danced the night away to the funky booty-shakin' sounds of "Dwanna and the Primetime Band" provided courtesy of Prime Source Entertainment. Dwanna brought down a packed house with a fantastic 4-hour set that kept the dance floor swinging into the wee- hours of the morning. Revelers two-stepped, ears a'ringin and cookies in hand out into the winter evening after a wonderfully festive kick off to the holiday season.